Last evening Ed Harcourt did a show at Santiago Alquimista. 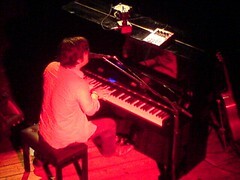 I went to the concert without having the faintest idea about who he was or what kind of music he played. Tuxa Heard a couple of his songs on the radio and liked it and so we decided to give it a shot. This is a kind of performer that I don’t get to see much of nowadays, the singer-songwriter who does it all by himself on stage, plays lots of instruments and fiercely loves his piano. And a really powerful voice to boot! The songs themselves are all over the map, from the pure sentimental, to the mellow to the noisy rock-style songs. Oh and the loops, we mustn’t forget about that because even if (as he said) it is not terribly original, it still is great fun to watch it be done and to listen to it. Anyway, live and on stage he rules! Oh and another thing: this was the first time I’ve ever been to Santiago Alquimista and I must say I absolutely loved it! I definitely must track down what goes on in there in the future because it just lends itself to the type of shows that I enjoy the most. I took a few pictures of the show with my cell phone (my my, how I’ve fallen for this one…). They’re at Flickr.